2004-07-26. New. Ships with Tracking Number! INTERNATIONAL WORLDWIDE Shipping available. Buy with confidence, excellent customer service! Kessinger Publishing, LLC, 2010-09-10. Hardcover. Good. Kessinger Publishing, LLC, 2004-07-26. Hardcover. Good. Kessinger Publishing, LLC, 2004-07-26. Hardcover. Used:Good. Kessinger Publishing, LLC, 2004-07-26. illustrated edition. Paperback. Used:Good. Kessinger Publishing, 2004-07-31. Paperback. Good. Excellent customer service. Prompt Customer Service. 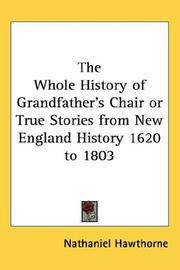 The Whole History of Grandfather's Chair or True Stories from New England His..